Looking for a 4K monitor for your PS4 Pro or Xbox One X? The ASUS VP28UQG is the best budget 4K display for competitive console gaming; it’s affordable, fast, and offers plenty of gaming features. 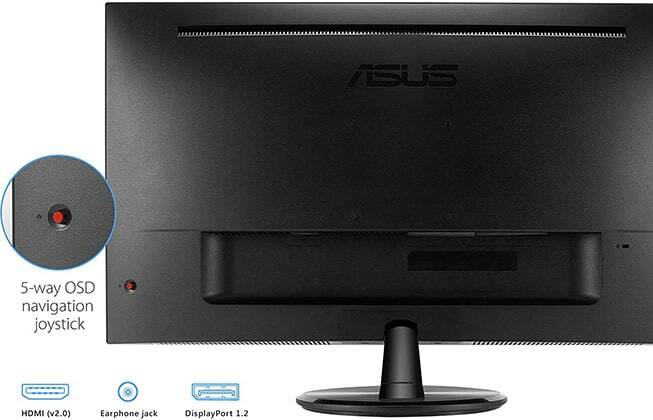 Keep in mind that the ASUS VP28UQG 28″ monitor features a TN (Twisted Nematic) panel which unlike the other monitor panel technologies such as IPS and VA has narrow 170°/160° viewing angles. This means that the picture will shift in color, contrast, and color when it’s viewed from skewed angles. However, since this monitor is 28″ in size and you’ll always be sitting directly in front of it when gaming, the viewing angles won’t be an issue. Another aspect where TN panels fall short is the color reproduction. In comparison to the other panels, TN panels have the least vibrant and accurate colors, but they also have the fastest response time speed; so it’s a fair trade-off if you’re into competitive gaming. More importantly, thanks to the 4K UHD resolution, the image will be crisp and sharp with vivid and clear details. 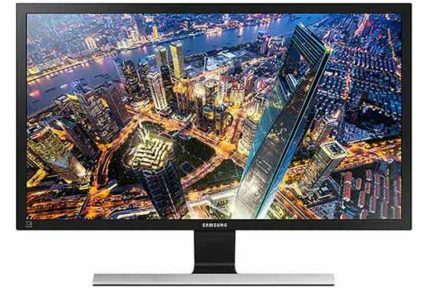 Other panel-related specs include a 300-nit peak brightness, 10-bit color depth via dithering, and a 1,000:1 static contrast ratio, all of which is standard at this price range. Thanks to its rapid 1ms response time speed, there’s no ghosting or motion blur of fast-moving objects which makes for a more enjoyable and smooth fast-paced gameplay. In addition, the ASUS VP28UQG input lag performance is top-notch at just below 10ms. The screen is flicker-free and has an integrated low blue light filter, so you won’t have to worry about eye strain even after prolonged gaming sessions. Moving on, the ASUS VP28UQG 4K monitor supports AMD FreeSync which can further improve the gaming experience if you have an AMD graphics card or an Xbox One/S/X console. FreeSync works by synchronizing the monitor’s refresh rate to the GPU’s frame rate which consequently eliminates issues with screen tearing and stuttering without introducing extra input lag. The ASUS VP28UQG FreeSync range is 40-60Hz/FPS (Frames Per Second), so when your FPS is below 40, FreeSync won’t do anything until the framerate is back up within the dynamic range. You can use the monitor with NVIDIA cards and PS4/Pro as well, just not the variable refresh rate technology. Update: FreeSync now also works without any issues when using a compatible NVIDIA G-SYNC graphics card. Further, the ASUS VP28UQG supports HDCP 2.2, so you can also stream content from Netflix, Amazon Video, etc in 4K UHD. You will also find the GamePlus features which consist of customizable crosshair overlays, an on-screen timer, and an FPS counter. Next, there are eight pre-calibrated picture presets for various viewing scenarios including Scenery, Theater, Game, Night View, Reading, Darkroom, sRGB, and the Standard mode. The OSD (On-Screen Display) menu is rather user-friendly and easily navigatable using the 5-way joystick placed at the back side of the monitor. The design of the monitor is tilt-only by -5°/20° and you can VESA mount it on a third-party stand using the 100 x 100mm pattern. Connectivity includes two HDMI 2.0 ports, a DisplayPort, and a headphones jack. So, you can simultaneously connect two consoles and a PC, and just change the input source on the monitor. AMD FreeSync works over HDMI and DisplayPort with a 40-60Hz dynamic refresh rate range. 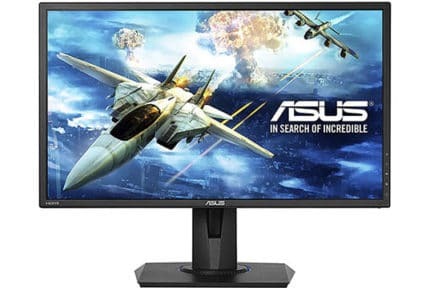 The ASUS VP28UQG price is $319 MSRP which makes it one of the most affordable 4K monitors overall and a great pick for console gaming. If you’d rather get a 4K IPS monitor with better colors and wider viewing angles (but a tad slower response time), consider the LG 27UK650 with FreeSync over HDMI and HDR (High Dynamic Range). Check out more choices in our best gaming monitors for PS4 Pro and Xbox One X buyer’s guide. For the money, the ASUS VP28UQG is the best gaming monitor for Xbox One X and PS4 Pro when it comes to competitive gameplay. In case you’re more of a casual gamer or prefer more graphically-oriented games, make sure to visit the above-mentioned buyer’s guide for alternatives. 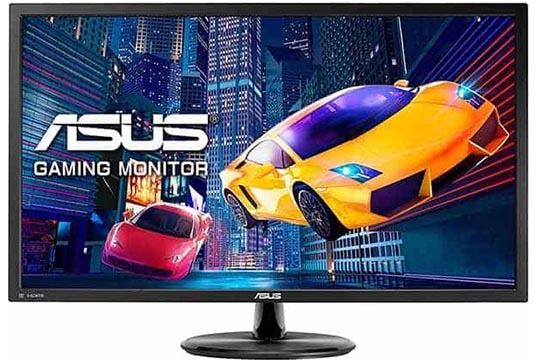 The ASUS VP28UQG is an affordable 28" 4K monitor with a quick response time speed, low input lag, and plenty of gaming features including FreeSync over HDMI which makes it an ideal budget choice for console gamers.